Note: The tables on pages 4 - 7 in the score correspond with preparations made on a Steinway B piano. 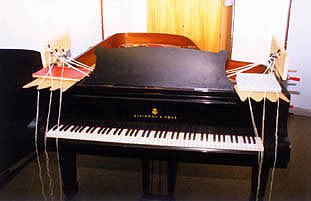 The first performance, however, was given on a Boston G193 (roughly equivalent in size to a Steinway A). Although smaller (requiring some of the dimensions given here to be slightly reduced), this piano proved to be very well suited to the preparations. 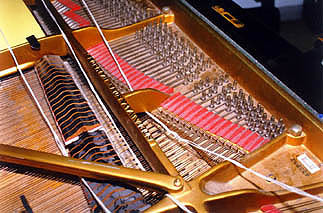 Note that, on the Boston, the strings from F1 to B1 inclusive are only double strung (whereas on the Steinway B they are triple) - in this case only one of the two rubber wedges is needed. 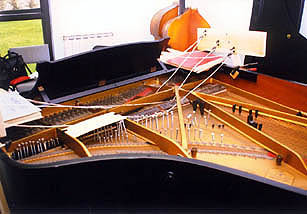 It will also be found that the position of the rubber wedge for Bb1 is limited by the piano frame - in this case the wedge should be positioned close to the piano frame. I am grateful to Colin Turner and the technicians at Steinway & Sons for their help and advice during the preparations at the Steinway Studios for the first performance - this was given by Andrew Ball at the Wigmore Hall on 17 February 1997. The rubber wedges can be cut from long rubber strips (or sheets), normally available from a good rubber-merchant - the rubber should be rather hard (for example, not unlike that used on the soles of shoes), and can be cut quite easily with a Stanley knife. Two thicknesses are used: 5.5mm (for most of the wedges) and 15mm for the 'fat wedges'. When cutting the wedges it is highly recommended to cut a little notch (or groove) either side and a few mm from the point of the wedge so that it can be 'clicked' into place when wedged between the strings. This stops the wedge from jumping out when the string in struck. This is particularly important on the lower strings, and when the wedges are placed in the middle of the strings. Obviously the size of the notch depends on the thickness of the string that is to fit in it, and the exact position of the notches should be such that the width between them matches (or is very slightly greater than) the distance between the adjacent strings of the course in question. When cutting the 'single-string' wedges (very lowest register), a deep slot should be cut from the tip of the wedge upwards about 15 mm so that the wedge can fit around the string like a clamp. If this slot also is cut rather wedge-shaped (wider at the top than the bottom), this will again help to hold the wedge in place when the string is played. The tables in the score show the optimum positions for the screws, bolts and wedges for each course of strings in order to achieve the given tunings of the most prominent 'sub-harmonics' and harmonics. In the case of the strings with 'sub-harmonics' - the sub-harmonic pitch given is the lowest audible one (in most cases a complex spectrum of other harmonics will result, but it is the lowest one that should be tuned). These sub-harmonics are produced when screws or bolts are placed at or near the middle of the string - the tuning is influenced both by the weight (i.e. length) of the screw or bolt, and by its precise position. The longer (heavier) the bolt, the deeper the sub harmonic. 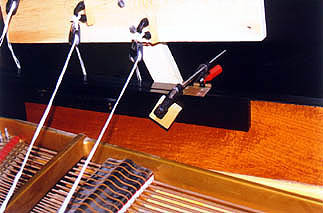 For fine tuning, moving the bolt towards the tail of the piano sharpens the sub harmonic pitch, moving it towards the keyboard end flattens it. The same is true of the very long rubber wedges (eg for C2, B1 and Bb1) which produce a deep, resonant (rather 'funky') thud. When fine tuning the position of the screws and bolts, the most important aspect is the (microtonal) relationships (sometimes very small intervals) between the sub-harmonic pitches, rather than their precise actual frequencies. Furthermore it will noted that the pitches of the sub harmonics, when played in a chromatic scale, do not form a straight line (i.e. when a downward chromatic scale is played, some sub-harmonic pitches will be heard to go up and some to go down) - these relationships are very important to observe. Very long (c. 6 metres, tripled) pieces of nylon cord are used (c. 2 mm thick), and threaded between the strings as shown on the tables. The cord should be rosined with cello rosin, with more rosin in the middle of the cord than at the ends (this is the best way to achieve the crescendi and diminuendi). With the piano lid removed, two 'side panels' should be clamped to the piano frame (either side of the music desk). Three pulleys are then fixed to each side panel, at a position determined by the 'cord route' for each cluster. and then back towards (and on either side of the player. In this way the player can bow the piano from his normal seated position, and therefore bow and play the keyboard simultaneously. The instruction 'right-side cords' means that the player should pull the cords for that cluster from the right-side pulleys, and the instruction 'left-side cords' means he should pull from the left-side pulleys. Obviously, for any given cluster/set of cords, these instructions ('right-side cords', 'left-side cords') will always alternate. Care should be taken, however, to prevent the three sets of cords getting entangled with each other! It is recommended to saw off the top of these bolts in order to avoid hitting the bolt-head with the rapid upward stroke. Note that, because of the fact that different types of preparation can result in drastically different dynamic levels, all the dynamic markings indicate the dynamic that is to be played, and not necessarily the dynamic that will be heard. For example the extreme upper register (C#6 to C7) sounds very quiet, and so in general is marked to be played rather strongly). Please refer to pages 3 - 7 of the score.